Killer Characters: Welcome Spring! A Gardener's Happy Day! Welcome Spring! A Gardener's Happy Day! Today is the first day of spring! Hurrah! As an avid gardener, today is the day I cling to during the winter months, when the frozen tundra of my backyard gives in to despair that I will ever be outside again. I love turning over my gardens, doing a clean up from the winter. nurturing the plants that need some TLC from the cold, and planting annuals in window boxes. Now, mind you, I live in New England. So I can't actually do any of these things for a few weeks. But today marks the day I can dream about them. When I go to the Triple B, I can place a plant order. My greenhouse moves into seedling production mode. I get out my colored pencils and my grid paper and plot what is going to go where this spring. Now, as if to tell me to hold my horses, Mother Nature has a N'or Easter planned for us this Thursday. But never mind, even that can't stop me from looking through seed catalogs and discussing my garden plans with Delia and Ernie. This is the happiest time of the year. The Garden Squad series is written by Julia Henry. 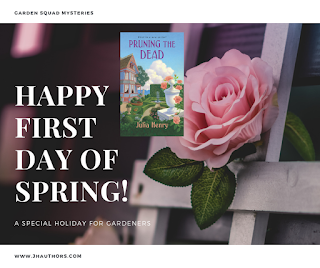 The first in the series, Pruning the Dead, was released in January. The second in the series, Tilling the Truth, will be out this August. As J.A. Hennrikus, Julie writes the Theater Cop series. The second in that series, With a Kiss I Die, will be out on April 8. I am so happy today! Spring is here! I at least will sweep my porch, wash off my table and pretend I have flowers!